Katmer pastry is thin and flaky and traditionally would be made totally by hand, stretching the dough until the sheets are thin. This is a flaky pastry that can be used for both sweet and savoury dishes. 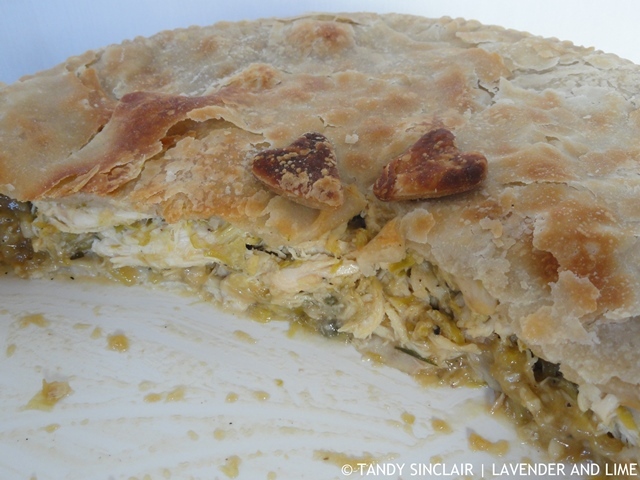 Here I have taken this Byzantine pastry and combined it with chicken and leeks to make a pie. transparency: tranˈspar(ə)nsi,trɑːn-,-ˈspɛː- noun: the condition of being transparent. 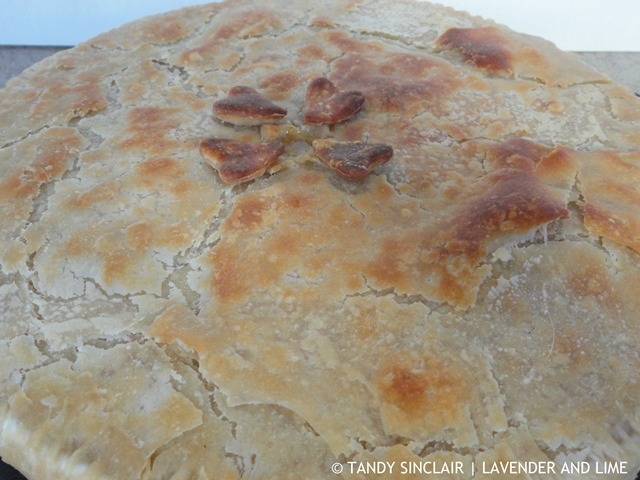 It is not often that I make a recipe once and put it up on the blog. But in this instance, it is exactly what I did. Dave and I do not eat starch during the week at night if we can possibly avoid it. It is part of his training regime, which I follow a lot more strictly than he does. I started making this pie on a Sunday and the filling took up much of the afternoon. I had already made the pastry as per the recipe given to us by Milkica from Mimi’s Kingdom and this thankfully did not mind being rested overnight. I used a seriously big chicken and made the pie with the pastry on the bottom and the top, as per Milkica’s method. However, the pastry on the bottom did not cook very well, and as we all know, in baking there is nothing worse than a soggy bottom. If I were to make the pie again, which I will do for when we have guests, I would only make it with the top layer of pastry. The recipe below is what I will follow and is not the one I made. But, I know for sure that it will work perfectly. This is a generous pie. Dave and I had dinner 3 nights in a row of the chicken and leek katmer pie with different salads accompanying the dish each night. Set aside the day to make this delicious tasting pie, you will be glad you did. I love chicken and leek pie- still waiting for the weather around here to cool down a bit before I can make dishes like these haha. The pastry looks amazing- so flaky!! 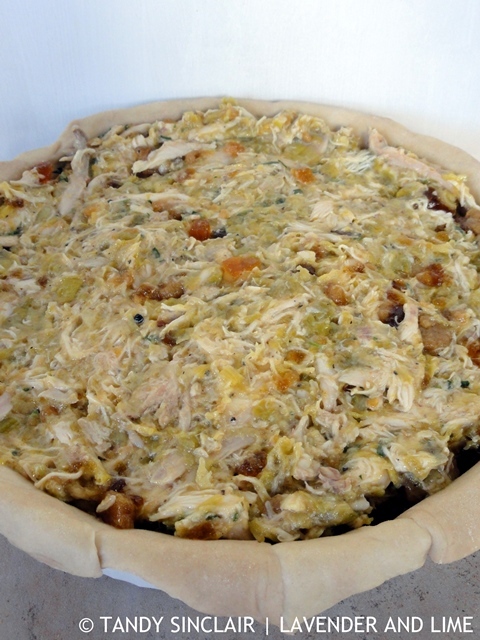 I again did not make the DK challenge but I so want to make this Katmer pie soon, even more so after seeing your. Just too bad for the soggy bottom, I am good at getting those so thanks for the tips. I love savory pies and I also love leeks. I do love leftovers, too! This sounds like it would go great at my house! It looks comforting, hearty, and delicious! It looks beautiful! I can see why you posted it after one try. This pie looks and sounds fantastic, Tandy. Ok how did I not realize before that both our significant others are named Dave! Hope you both loved this pie- it looks absolutely stunning! Your filling sounds delicious! How horrible to have gotten a soggy bottom though! Your pastry looks wonderfully flaky so at least you could enjoy eating the top. what a lovely dish! I’m a huge chicken fan, so i’d die to try it! This looks SOOOO hearty Tandy! Hi Tandy, oh does this look fabulous, love the little hearts on top. Tandy, sounds good! Yes, you’re right, nothing worse than a soggy bottom in a pie. Nothing wrong with a top-crust-only pie! Thanks for teaching me something new today Tandy, my first time hearing about Katmer pastry! There’s nothing better than a really good, flaky crust!! And tarragon is my favorite herb to pair with chicken. So delicious. This looks so yummy Tandy, I’ll have to try it. I think leeks are such an underused ingredient, so it always makes me happy when I see bloggers posting recipes with them. We love leeks!